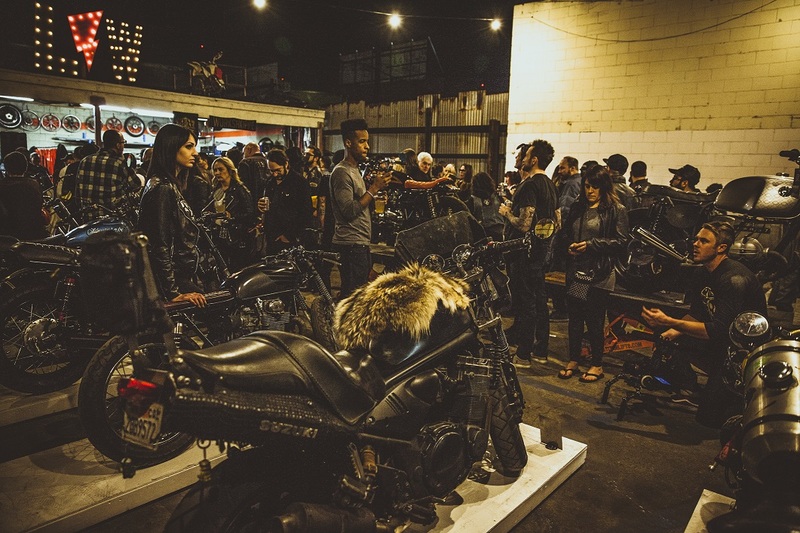 This past weekend, MotoLady held the third annual Women’s Motorcycle Show at Lucky Wheels Garage on the edge of DTLA… and it blew the roof off. Featuring 27 bikes from Northern California to Dallas, Texas, and even Mexico City, built for or by women with an emphasis on the customization being specific to the ladies needs and wants for their type of riding. The point? To say hey, we’re here, and we love to ride too. Women will spent a lot of time and energy creating the exact riding experience they want both in terms of their bike and gear—some just need to be shown that it’s possible. Either by their own hands or via aftermarket parts or one-off custom work at a shop with their design input. Far too often the words “my bike isn’t good enough for a show” are uttered by a woman. Sometimes ladies need that extra push to feel confident enough to put themselves in the limelight, especially in the still-male-dominated world of motorcycling. 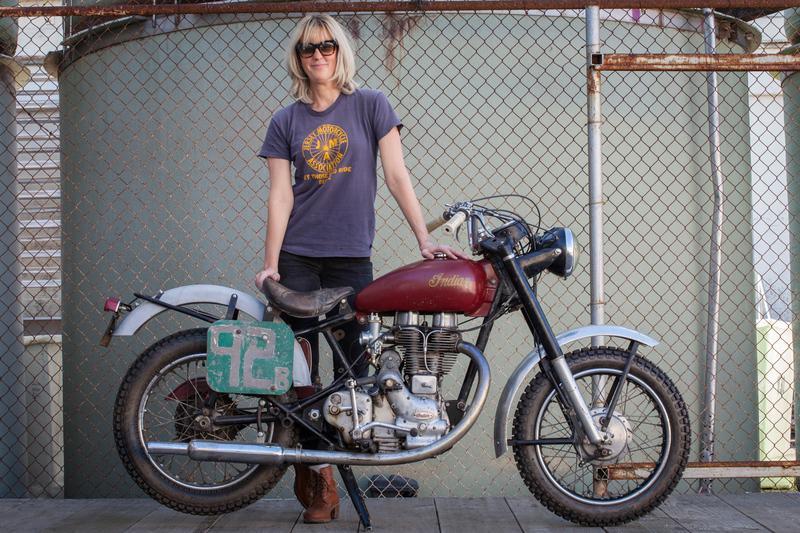 The hope is that the Women’s Motorcycle Show helps that fact, by surrounding them with like-minded, badass people who support diversity in the two wheeled world. Ten minutes ‘til official show start at 6p a roar of motorcycles bounced down the street and parked outside. 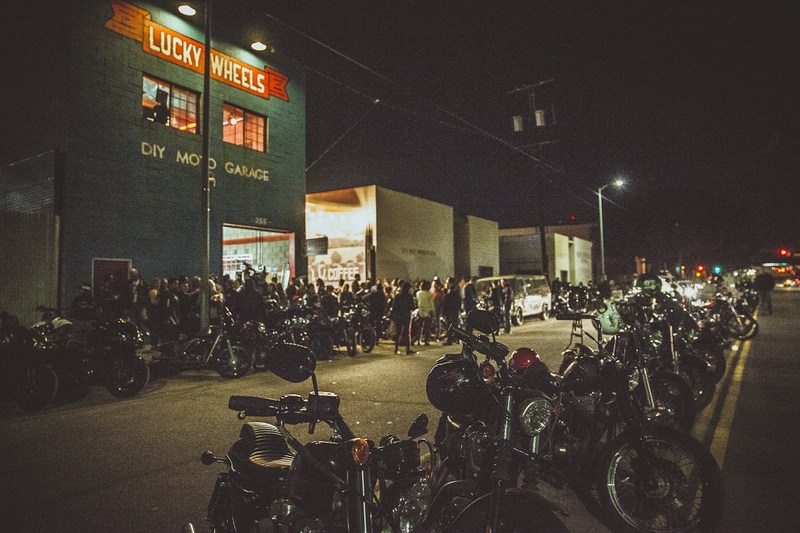 Luckily for us, the last bikes had been set in their places on white boxes and hydraulic lifts inside and outside Lucky Wheels Garage located on N Mission Road at the edge of downtown LA. Riders started to funnel in, grab drinks and mingle. Outside, the Burnt to a Crisp BBQ Smokehouse food truck was poised in wait for hungry bikers riding from all over California, Vegas, and beyond. But none of us were quite ready for what lie ahead! The 3,000 SF shop and open back yard area filled quickly and didn’t let up until the end of the night. Lucky Wheels Café almost ran out of coffee, the bar sold out of beer and started tapping out the whiskey supply, the food truck had a record breaking night, and Women’s Motorcycle Show apparel flew off the shelves in just over an hour. Bikes were parked up and down either side of the street for blocks, stretching all the way to the 101 freeway… even in the center of the road down the double yellow lines. After multiple attempts to count motorcycles, anyone who tried giving up near 600 in any given area, plus Taxi/Uber/Lyft drop offs and car drivers, we had to have at least 1,500 people. We all believe that’s a conservative estimate. We’ve all been to a few motorcycle shows in our day. Most of them follow a pretty similar mold. We wanted to break it. Featuring an art wall, motorcycle shaped piñata packed with airplane size bottles of booze, live music from Stephen El Rey and Low Volts (two bluesy-rock one-man bands), the Real Deal maker demo booth, and even a special light show from the LAPD… it was a night to remember! Jessi Combs (land speed & baja racer, TV show host and so much more) and Theresa Contreras (builder, painter, artist of LGE-CTS Motorsports) conceptualized a non-profit business called “Real Deal” that helps get women’s hands dirty with the industrial arts. The Real Deal booth pops up at events like Chopperfest, Babes Ride Out, and now the Women’s Motorcycle Show. 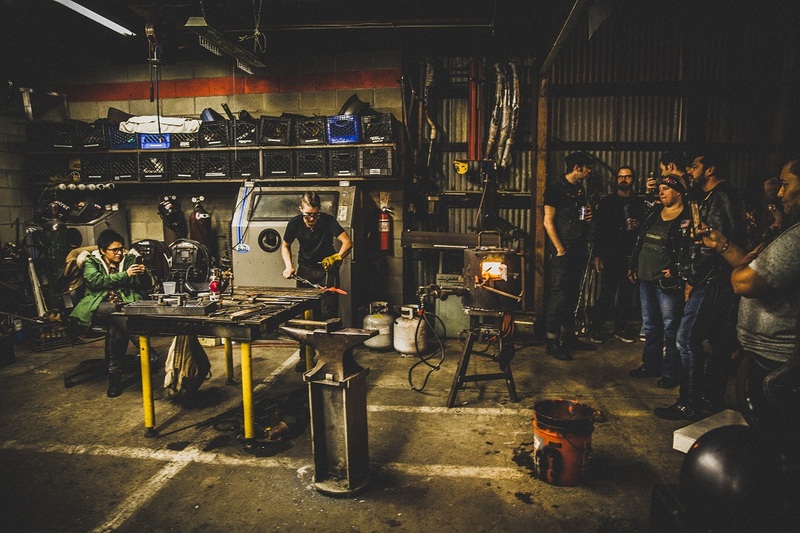 Featuring Jessi Combs on the welder, Theresa Contreras on pinstriping, and Joy Brenneman (aka Joy Fire) with her gas-powered forge on blacksmithing… they gave men, women, and kids an opportunity to try their hand at these complex skills throughout the evening. The banging of the hammer and anvil, sparking welder, and focused painters gave the show another layer of entertainment for families and those steering clear of the bar. Ok ok, alright time to spill. Let’s get down to the nitty gritty. The cops showed up. Yup, the LAPD came in HOT on our little-turned-rager motorcycle get-together. Approximately 9:25 a Police helicopter began to circle the event, exciting the masses who held up their smartphones to record the action across social media. The light shined over all the show bikes, providing photographers a little extra help in the dark night outdoor light, and up and down Mission Road, giving people quite the show. At 9:35 we got word that there were a boat-load of squad cars (read: 10) parked up the road on North Mission where the freeway on ramps are, announcing that tow trucks were en route to pick up those aforementioned yellow-line parked motos. Emcee Dustyn Ellis made the announcement for folks to go move their bikes and that we would wait for people to come back in to announce the raffle winners. As some people were starting to return, and we were about to do last call on raffle ticket sales (which were a whole $1)… we got the bad news the Police were none too pleased with the burgeoning biker soiree taking over the street and that we had to pull the plug. After the sad announcement we had to call it and apologies for the trouble, we asked everyone to be respectful when leaving as to not piss off the LAPD more, and called it a night. 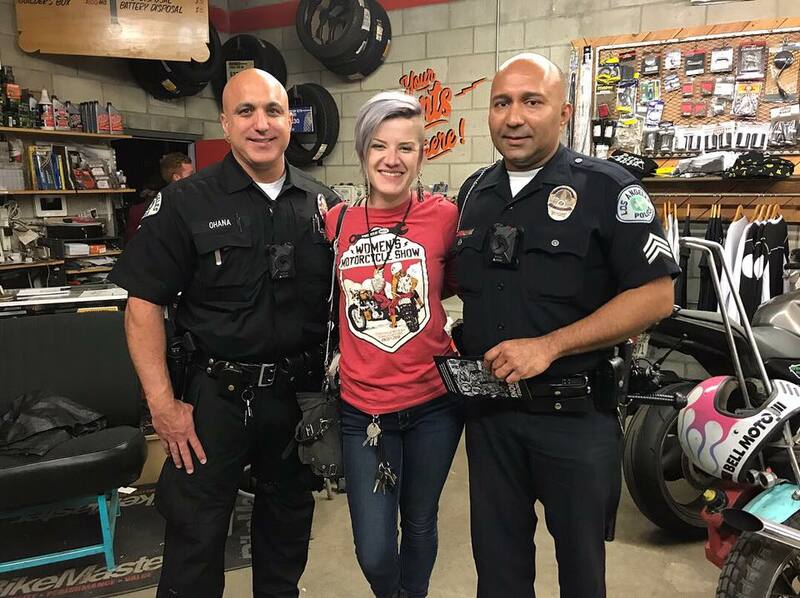 As Alicia, MotoLady and Women’s Motorcycle Show founder, finally made her way back toward the shop entrance, two LAPD Officers came in to chat. And guess what… they were super cool! When they had realized it was a Women’s Motorcycle Show, they not only felt terrible for having to shut us down, but seemed a little jealous they weren’t able to attend. One of the officers told us (on video) “the Women’s Motorcycle Show is pretty cool!” and the other talked with Alicia about helping her with getting permits to shut the street down next year. Other comments included “this may be the first time in the history of our chopper that no one flipped it off”, and “usually we find broken glass, fighting, drugs, and belligerent people when we go to these types of calls, but instead it was just a bunch of normal people… hanging out.” We thanked each other, and they went on to fight crime. Everyone was ushered out at 9:47pm, just 13 minutes before the event was supposed to officially end (though it probably wouldn’t have, honestly). To remedy the raffle prize announcement snafu, I pulled tickets for winners on the Women’s Motorcycle Show instagram story feed live, and then posted them on the website. Almost all the prizes are already claimed… proving that people are hungry for the new gear and goodies! Now that the third year of the Women’s Motorcycle Show is wrapped, we’re immediately diving into plans for making next year bigger and better. Lucky Wheels Garage being an amazing community space keeps us wanting to use the same venue in the future, but obviously we outgrew the given space. We’ve got some ideas and tricks up our sleeve, so 2019 should have even more interactive entertainment and cool bikes from lady riders across America (and beyond)! Until then, check out a handful of the bikes that were on display below. 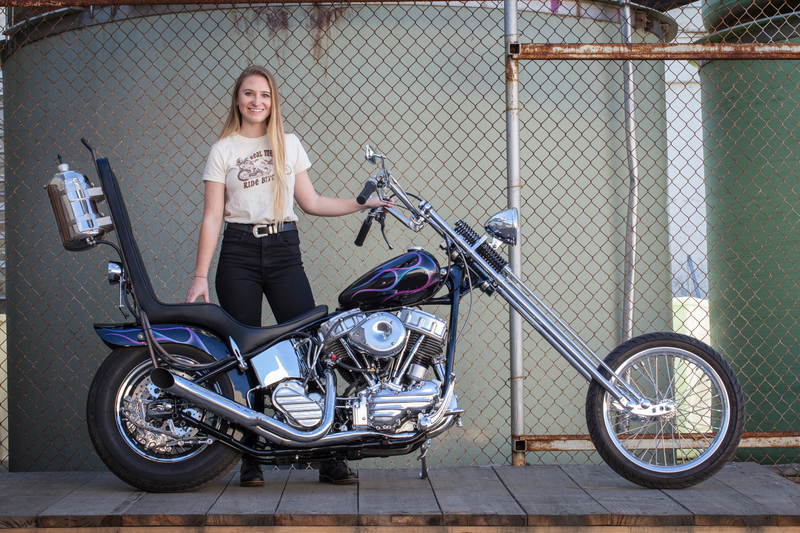 Megan Margeson of Torrance, CA with her 1964 Harley Davidson Panhead Chopper. 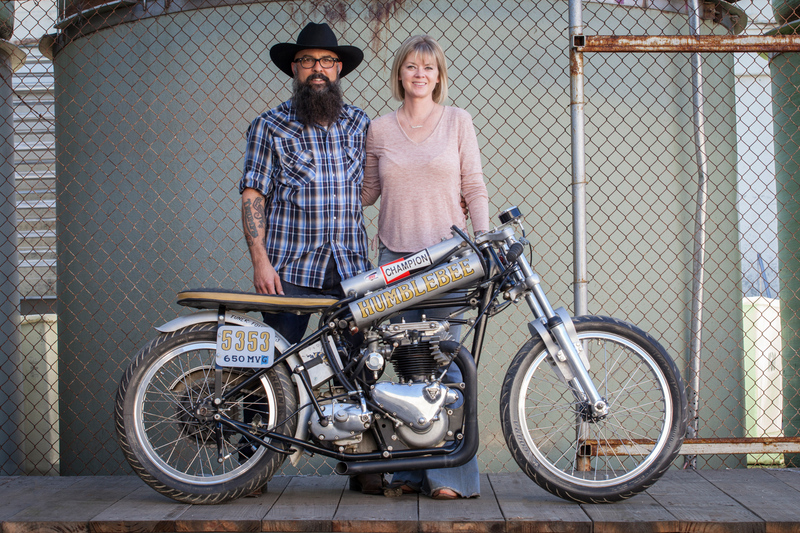 Salt flats racer Kristine Peach of Calabasas, CA with her hubby Wes of Four Aces Cycles, builder. 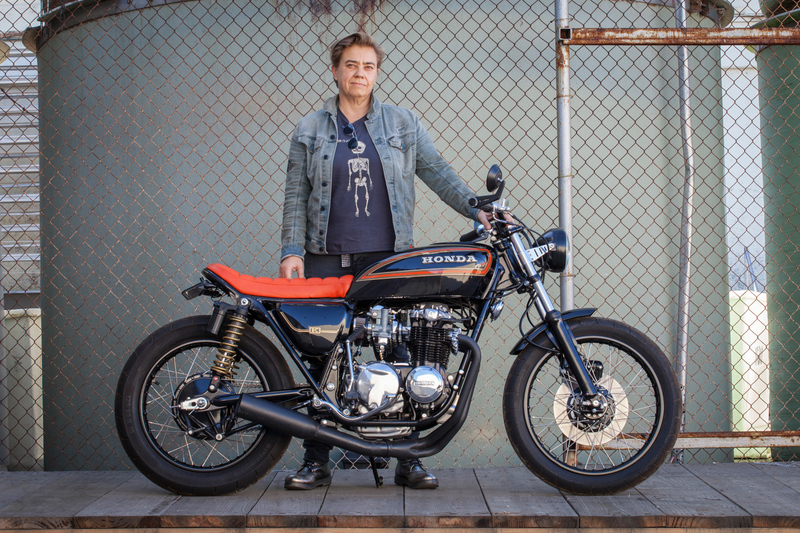 Jessica Schaeffer of Venice, CA with her fully restored and modernized ‘78 CB550. 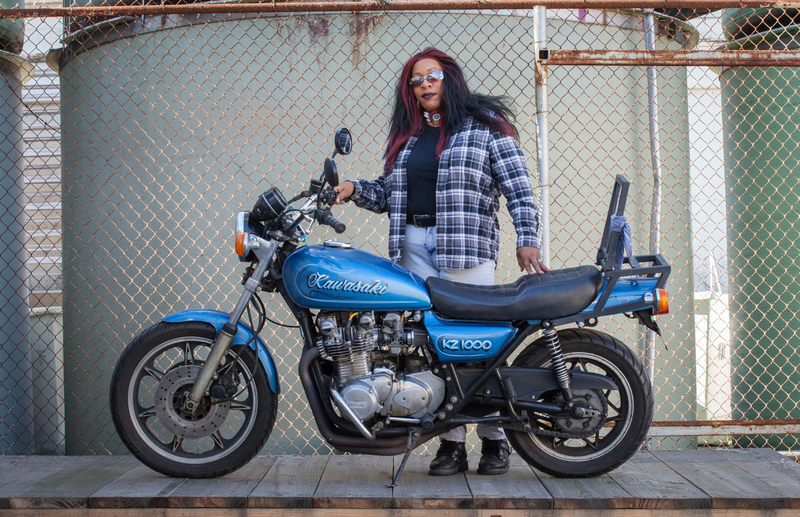 Nikkie Robinson of Long Beach with her 1976 Kawasaki KZ900. Caroline Patterson with her 1956 Indian Woodsman. Women’s Motorcycle Show currently has no website. Use http://themotolady.com or http://instagram.com/womensmotoshow !